Peter, the African-American child portrayed in The Snowy Day would go on to appear in six more books, growing from a small boy in The Snowy Day to adolescence in Pet Show. For the first time, in conjunction with the Ezra Jack Keats Foundation we are offering a limited edition print of Peter, reading and dreaming, as his imagination takes him to The Land of Play. 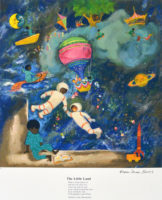 The Land of Play is an illustration by Ezra Jack Keats of the poem below by Robert Louis Stevenson.